I got these kids from Peter what feels like ages ago, but they've finally pupated for me. Started out with 4 and lost two as larvae, but it looks like I got lucky and ended up with one male and one female. 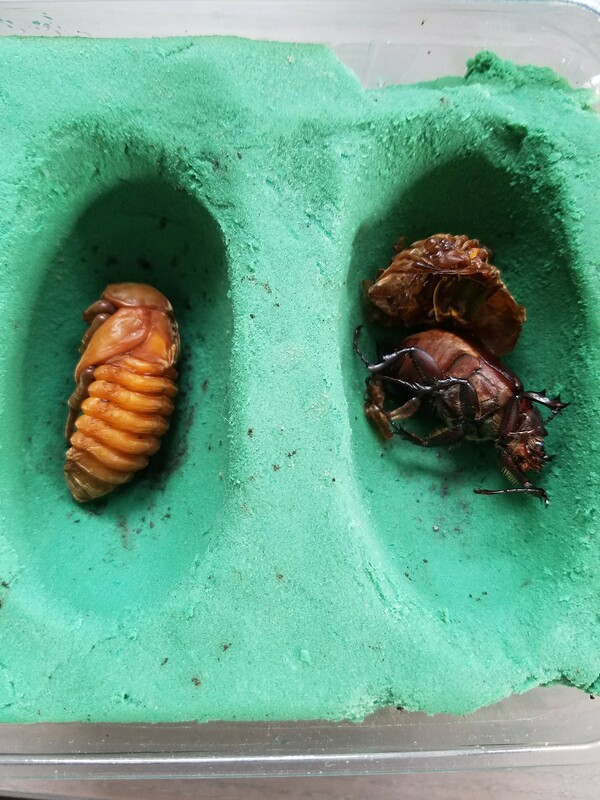 Hopefully both manage to make it out of the pupal stage with no problem. I made artificial chambers for them mostly because I was worried about some of the little worms I saw in their substrate. They were all relatively small ones, so I'm not sure that they would've done any significant damage even over time, but better safe than sorry. I'm a little concerned that the chambers I made might be too big, but I'll check in on them tomorrow and see if they've managed to turn themselves around. Congrats! I also got 4 from him, but unfortunately all of them died. Fingers crossed these little ones pull through and breed for you! Thanks & congrats on your three! 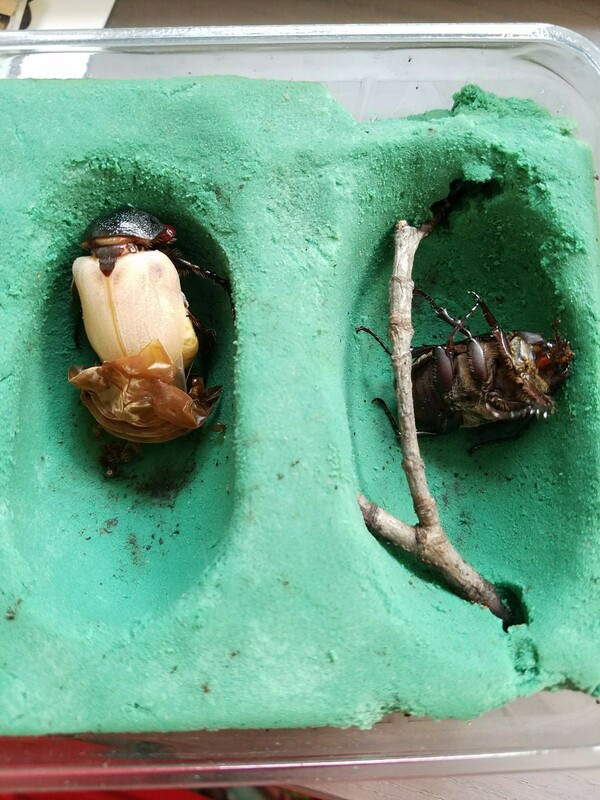 I know you said you didn't get to see the action, but would you happen to know approximately how long it takes for them to become active once they emerge from their pupal cases? And yeah, that is really interesting! I didn't actually know that about them since I'm not that familiar with this species. It's probably a coincidence, but I still can't help but wonder if it has anything to do with the recent heat wave sweeping through. Alright thanks! I'll hit him up. In recent news, the female just eclosed sometime last night/this morning, and I was lucky enough to get a shot of her while her she was still soft. 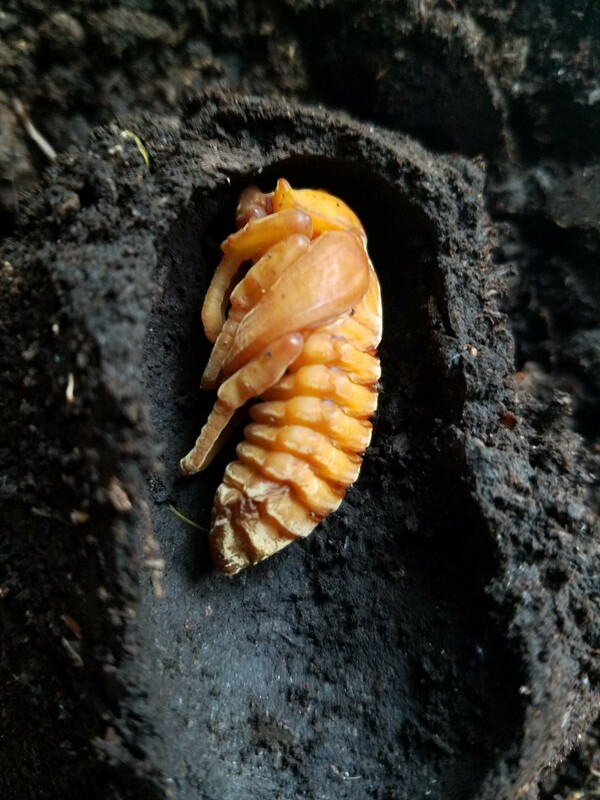 ...would you happen to know approximately how long it takes for them to become active once they emerge from their pupal cases? 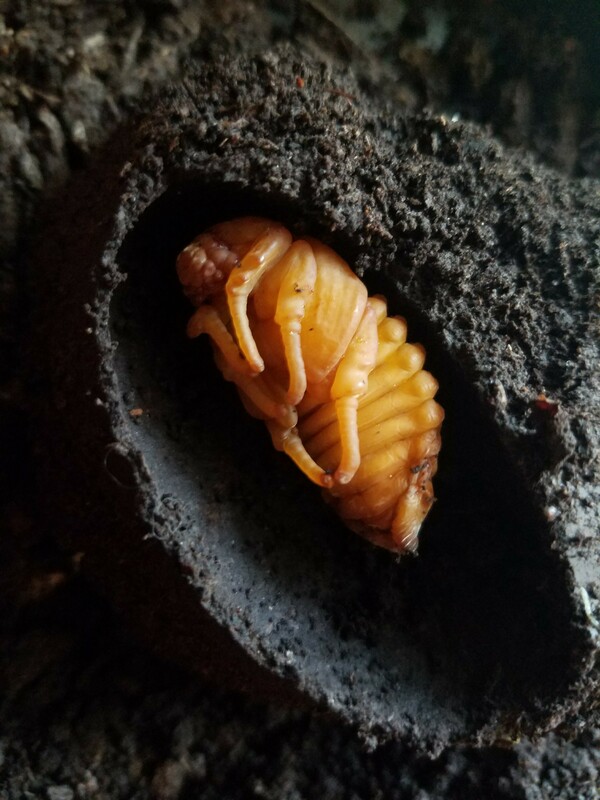 In my experience, punctulatus usually leave their pupal cells less than a month after eclosion. I'm not sure if they're ready to mate immediately upon emergence from the cell, but I always wait at least 5 to 7 days before introducing females to males. Good to hear; thank you! 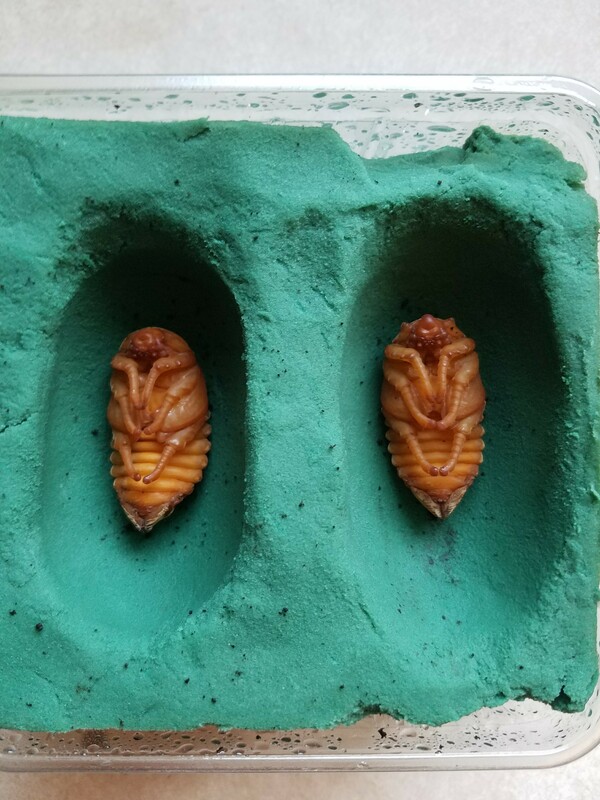 Would it be unwarranted to remove them from their pupal cells into a separate container? The one their pupal cells is in is rather small and doesn't have much room between the top of the foam and the lid, so it worries me that I won't be able to tell when they're actually active and ready to feed. I wouldn't attempt to move them to another container until they've had at least several days to partially harden, following eclosion. You could transfer each into something such as a 16 oz. deli container that's about 75% filled with substrate. You can either bury them, or just leave them on the surface. Either way, I'm sure that when they have truly become active, they will start to wander around noticeably, at which point you can try offering them some food. If they've just eclosed as of several days ago, you can probably expect to wait at least several more weeks before they fully harden and become active. Unlike butterflies and moths, most beetles' exoskeletons can't reach full hardness in just a matter of hours - it takes much longer, due to their heavy armor. 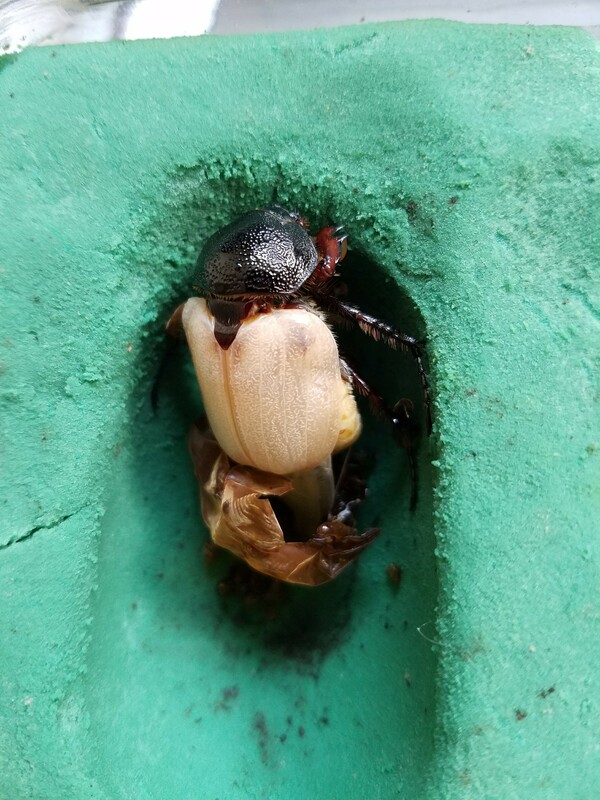 Some beetles spend months in their pupal cells, following eclosion. However, this isn't necessarily because that's how long it takes for them to harden - it's often due to the fact that some species have a post-eclosion diapause, while they wait for seasonal changes in temperature / moisture.